The following tutorial describes the pln to pdf conversion from the ArchiCAD application by using a pdf converter such as novaPDF. You can get novaPDF from the Download page if you do not have it installed on your computer and test this conversion. The ArchiCAD suite is CAD architectural software with deployment on Windows and Mac OS driven computers, capable of both 2d and 3d environment creation. This includes templates for closed areas such as inside buildings, houses, apartments as well as whole building infrastructures, parks, whole urban areas and more. The application also includes a large library of templates, building plans, architectural objects (walls, ceilings, floors, doors, windows, curtains etc) and simplifies the process of putting them together with a good interface and good space management tools. The .pln file type is used as the ArchiCAD solo project file containing 3D models. It also includes construction simulation to view all the steps in the construction of the building in real time. The file type is proprietary and can only be opened by ArchiCAD. However the application can also open other proprietary file types such as DWG, DXF and IFC belonging to other suites, in concordance with the International Alliance for Interoperability on architectural CAD design. Still, sharing the file with other people for project consultation or sending it over the internet knowing that the person receiving the file will need to also have the ArchiCAD software installed can be a pain regarding collaboration. So having the drawing in PDF format can be a huge advantage in performing such tasks as all the used would need to view the file would be a PDF reader and there is an abundance of readers available. NovaPDF would also bring additional features to this if used for the conversion such as security options on the file, merging, mail sending, bookmarking and watermarking etc. Open ArchiCAD, then go to File->Open or press Ctrl+O to browse for the file you want to convert to PDF. Go to File->Print or press Ctrl+P to Open the Print window. 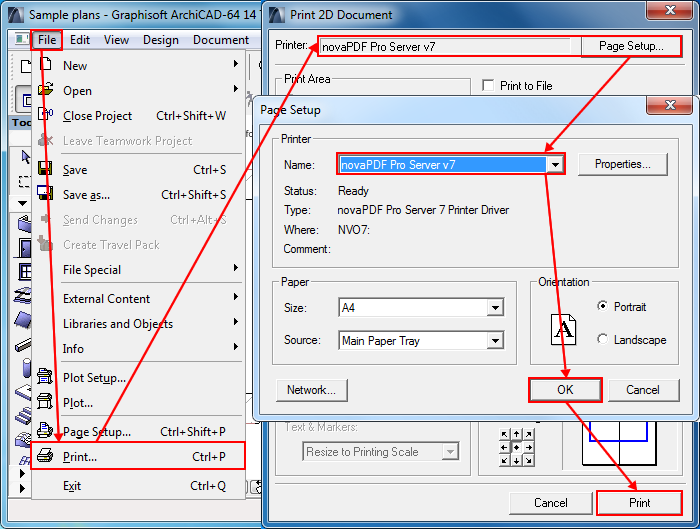 Click on Page Setup and in the Printer window select novaPDF from the drop-down list. After selecting the printer, click OK and then select Print. Choose the path where to save the file and other after print options and the .pln will be converted to PDF.